I’ve been writing a lot lately about the Tour de France, but my true sporting love is golf. I don’t write about it nearly as often as I think of doing so. For instance, I have intended since last August to write a post about the US Amateur championship, which I attended for a day with my friend John down at Chambers Bay, site of the 2015 US Open. I may still write it. The problem is that typically there’s too much I want to say about any given tournament or issue. Take last Sunday, perhaps not a typical day. Once the Tour stage ended, I switched to the Golf Channel to catch the close of the Scottish Open and an exciting victory by Luke Donald. A few hours later, it was time to check in on the John Deere Classic — the one-time Quad Cities Open — played in Illinois near the Quad Cities. Steve Stricker won in dramatic fashion with a birdie on 18 fashioned out of an approach shot from the slope of a fairway bunker with a terrible stance followed by a long putt from the fringe that dove into the hole. His third straight win in the Quad Cities. And then there was the women’s US Open, which had been plagued by stormy weather all weekend. Moments after I turned it on, the horn went off signaling the stop of play as thunderstorms approached. Ultimately, play was completed Monday morning, with NBC unceremoniously dumping the coverage onto the Golf Channel. No interrupting the Today Show for the most important women’s golf tournament of the year. There was enough material there for several posts, including one about the sad state of women’s professional golf, which is poorly covered and therefore hard to follow even for the few of us who care. I didn’t know where to begin. And here we are, on the weekend of an event I love, all the more since attending a day of the Open Championship in 1990 at St. Andrews and all of it in 2004 at Troon. I’m going to keep it simple. 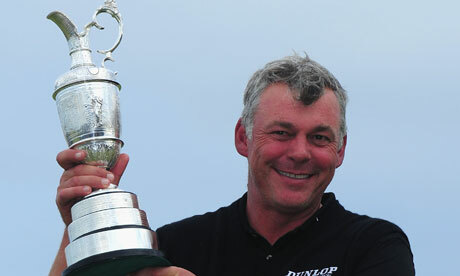 Darren Clarke was the surprise winner, but he played so consistently well day after day that by the end it was no surprise at all. And a popular victory it was. I was particularly struck, as Clarke stood at the 18th green during the formal announcements of the awards ceremony, awaiting the claret jug, when Davis Love out from the clubhouse to congratulate Clarke and have a few private words, putting his arm around Clarke, punching him lightly on the arm, showing great affection and sharing the pleasure of his win. A minute later, as the formal remarks continued, Phil Mickelson came over from a few yards away, where he had been standing with fellow runner-up Dustin Johnson, to put his arm around Darren and chat. Everyone knew their obvious bond, what with Darren’s wife Heather dying of breast cancer five years ago and Phil’s wife Amy battling it more recently. I don’t imagine there could have been a more beloved winner. Clarke has links golf running through his veins. He understands the importance of the ball flight – the lower the better – and that a golfer has no better friend than par in the wind and rain that swept across the golf course all day. A famously impatient man, he also found it within himself on this day of days to wait for the championship to come to him. And come it did. His scoring highlight came at the par‑five 7th, where he holed from 30 feet for an eagle, the perfect riposte to an earlier eagle at the same hole by the charging Mickelson who had briefly taken a share of the lead. But the true beauty of his performance lay in its incremental parts. A cut shot here, a running hook there, a four-foot putt rammed into the back of the cup – like a painter laying down his brush strokes until, finally, the masterpiece is complete. On a couple of occasions the bounce went his way, but for every piece of good fortune there was a putt that lipped the hole and somehow stayed above ground. There was no luck in this victory, only sweetness and redemption. It was not so long ago that Clarke was written off by some “experts” – a premature dismissal that apparently spurred him on. “You know, bad times in golf are more frequent than the good times,” he said, eyeing the Claret Jug beside him.